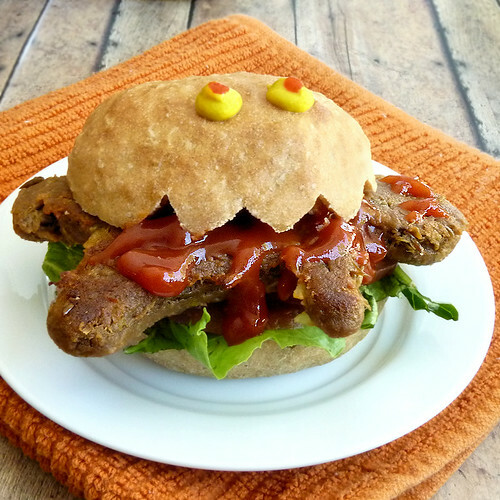 Wing It Vegan: Halloweegan Dead Man Burgers! This is possibly one of my favorite Halloweegan treats ever! It's like some sort of voodoo burger! Chomp chomp chomp! At first it was just going to be a normal bun, but ha! I laugh at normality! Honestly, the whole thing looked like a turtle at first. So Mr. Wing-It said what if you could make the bun look like a mouth eating the dead dude? By golly, I married an evil genius! So I grabbed the mustard and the ketchup, and drew eyes on the bun. Huge difference! It sure didn't look like a turtle anymore. But because we didn't have any lettuce to make it purdy, plus I wanted to make the bun look like it had monstery teeth, the original Dead Man Burger was deemed just a test run. The second batch of Dead Man Burgers had toothy buns, which were easy to make by cutting the front of the bun in a zigzag motion instead of a straight cut, like the rest of the bun. Use a small, serrated, pointy knife. The second batch also had more bloody ketchup all over! Mwahahahaha! I think I like the mustardy eyes from the test-run batch better than the ketchupy eyes though. They stand out more. And I totally forgot to draw eveel ketchup eyebrows on the bun the second time. Oy! To make the Dead Man patties you're going to need a gingerbread shaped cookie cutter, some wax paper, breadcrumbs, and your favorite veggie burger recipe. Instead of shaping the patties as you normally would, place the cookie cutter on the wax paper, sprinkle with breadcrumbs to prevent stickiness, and drop a chunk of patty mix in there. Press the mix down with your fingertips to cover the whole gingerbready area, remove the cookie cutter, peel the wax paper off the dead dude (heehee!) and cook as you would cook normal non-creepy patties. To peel the dead dude off the paper, place it on the palm of your hand (man-down, paper-up) and carefully use your other hand to peel off the paper. I would share the recipe for the veggie burger mix that I used but it was a little mushy. Now that's eveel! Today's Blog-Love goes out to Jessy @ happyveganface! Jessy took a break from blogging and now she's back! She livens up the blogosphere with her positive and happy energy, and her fantasticalness has been greatly missed. Her recipes are always rockin', and Dan's (her firefighting hubster) cooking is totally awesome as well. I'm sure you're already a fan of Jessy's, but if you're new to the vegan blog scene and you still don't know which blogs are a must-read, you have to check out Jessy's blog! I second what JL said! Mr Wing-It and yourself are a pair of evil geniuses! Loving your work. Wholly Crap! This is so awesome! I love it! This is so funny! Very creativeand tasty, YUM! Those are so funny! You and Mr. Wing It are so creative. Oh my cute burger goodness!! 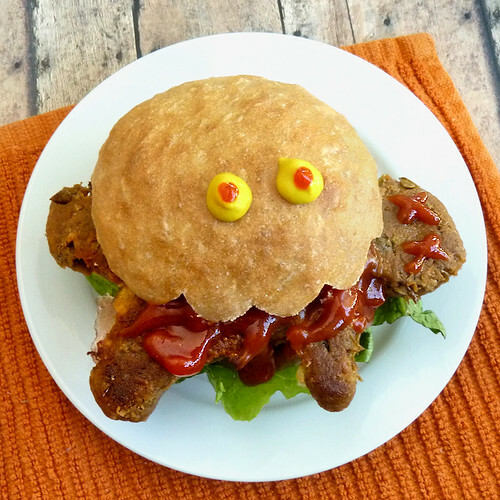 So ironic, a dead man vegan burger :) Love the toothy buns especially. And love the Jessy love--it's sooo good to have her back! Oh, I looooove it! But not as much as my two little darlings will when I show them!!! I knew I should have brought my cookie cutters to Seattle. I just didn't know why, until now. These burgers are hilarious. I sense that I'm going to be leaving a lot of "OMG THAT IS SO CUTE ADORABLE AAHHH!" comments here this month. This is no exception. 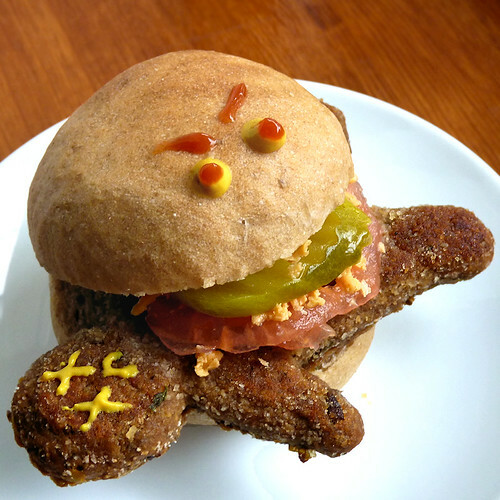 River - i couldn't stop laughing at your super fun 'n brilliant Halloweegan dead man burgers! your creativity never ceases to amaze me. :) the X's made of mustard on the dead man and the silly monster eyes on the man-eating burgers = too funny! hooray for you and Mr. Wing-It making one awesome evil genius team! i'd also like to say thank you SO VERY MUCH for the blog love! you totally made my night. thank you for all the kind words and support - and thanks for sharing my blog on yours. many hugs and many more happyfaces are coming your way! I love it. A savory recipe! I actually like the test guy better - the evil eyebrows really are key. Congrats on the feature too - those spiders were disgustingly cute so I am not surprised. Ha ha! 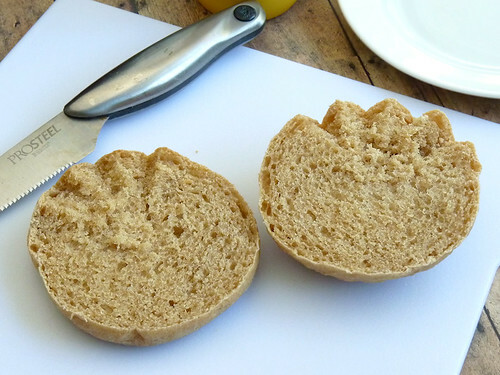 I love food with a sense of humor- so cute! Ahh this is so ridiculously cute! I am so excited for halloweegan! Oh I LOVE LOVE LOVE these River! Who doesn't wanna chow down on a dead man?? I sure as heck do. Ack, haha this is too cute! I would get such a kick out of this if someone served it to me for dinner... I just adore your Halloween ideas, they're all amazing already! I love this! My boys would go crazy over these! Thank you for filling my afternoon with smiles and laughter as always. Between the detail on the the bun and then the detail on the patty you definitely make me smile. I'm so glad you're back with your halloweenie-ness. You deserve a spot on Martha Stewart's halloween show. Gah! These are fantastical!! And I'm so happy I found your awesome blog, YAY!! Ha, ha, ha, this is great! LOVE it! they are so cute (but eeeeevil).